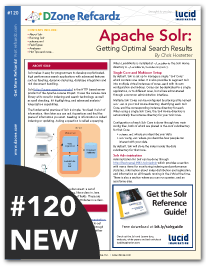 For those of you interested in adding search functionality into your Java based applications, this week's refcard, Apache Solr: Getting Optimal Search Results should be of interest to you. Solr is the HTTP-based server product of the Apache Lucene Project. It makes it easy for programmers to develop sophisticated, high performance search applications. The refcard gives a great overview of all the different features available in Solr, giving an introduction to the core concepts. You'll find out how to setup a Solr instance and get a high level look at schema.xml, the configuration file that controls how your searchable index is built. There are a few different ways to add documents to your index, either though CSV, XML or one of the client libraries that are available. No doubt after reading the refcard, and trying out Solr, you'll want to take a look at some of the more advanced topics like distributed search, clustering and the MoreLikeThis component. If you do want to follow on from this refcard, be sure to download LucidWorks detailed reference guide, and to check out the Solr wiki pages.